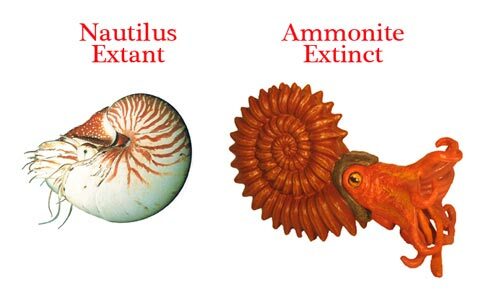 Why did the Ammonites go Extinct but the Nautilus Survive? A team of international researchers led by scientists from the American Museum of Natural History (New York), have been trying to unravel one of the great mysteries of invertebrate palaeontology. Why did the Ammonites go extinct but their relative the Nautilus survive the Cretaceous extinction event? 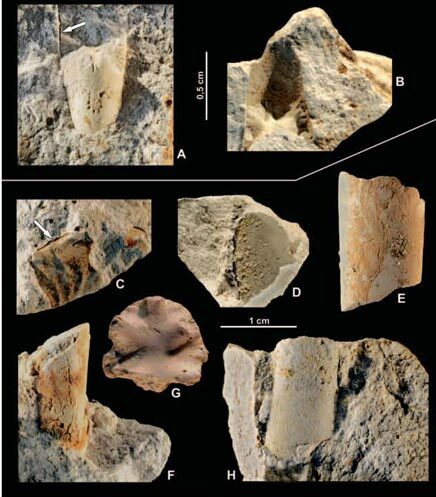 Building on previous research, lead author of the scientific paper, published this week in the journal “Geology”, Dr. Neil Landman believes that over specialisation and limited geographic distribution led to the downfall of this particular group of chambered shelled molluscs. Similar creatures but only the Nautilus is around today. Ammonites belong to the Class Cephalopoda and they seem to have been entirely marine, pelagic animals (living above the sea floor). Although more closely related to today’s cuttlefish, Ammonites and their living relative the Nautilus both had coiled, chambered shells. The first Nautiloids can be traced back to the Late Cambrian, whilst the Ammonites are believed to have originated in the Devonian geological period. There are two extant genera of Nautilus alive today. These animals tend to be found in deep water (up to seven hundred metres, although more usually around three to four hundred metres) and they inhabit the deeper slopes of coral reefs in the Indo-Pacific. They are believed to be scavengers feeding on a variety of dead animal matter. In this new study, the researchers including scientists from the Royal Belgian Institute of Natural Sciences, Saint Petersburg State University, Polska Akademia Nauk (Warsaw), Bowling Green State University (Ohio) and the Natural History Museum of Maastricht (Holland) as well as Dr. Landman, mapped all the locations of Ammonite fossil finds in the last half a million years or so of the Cretaceous (Maastrichtian faunal stage). They then compared this data with the occurrences of the Nautiloid genus Eutrephoceras over the same period. The scientists also included information from a recently published study that looked at Ammonite genera that appear to have briefly survived beyond the Cretaceous into the Palaeogene. What? Evidence of Ammonites surviving beyond the Cretaceous extinction event we hear you ask! There is some evidence to suggest that a few types of Ammonite did indeed survive into the Age of Mammals. Perhaps the very last of this great group of marine invertebrates lived for a hundred thousand years or so before they too finally became extinct. In a few, very special locations the sequence of strata that was led down at the end of the Cretaceous (Maastrichtian faunal stage) and the first deposits of the Palaeogene (Palaeocene epoch, Danian faunal stage) can be identified. One such location is the cliffs at Stevns Klint on the Danish island of Sjaelland. Fragmentary fossils representing two different genera of Ammonite have been identified from the strata immediately above the thin, dark line that marks the end of the Cretaceous. 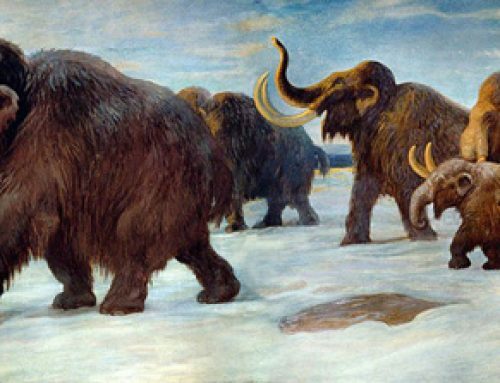 Dr. Landman has been at the forefront of these studies and he believes as many as six species may have lingered, sort of “dead clades swimming”. Fragmentary fossils indicate survival of some species into the Palaeocene Epoch. The picture above shows Ammonite fossilised remains found in the Palaeocene aged strata at Stevns Klint and surrounding area. Pictures A, B and D-H are fossils of the Ammonite Baculites vertebralis whereas picture C represents the species Hoploscaphites constrictus. The white arrows in pictures A and C indicate voids left after the dissolution of the original aragonite shell. The research team plotted the fossil data against two criteria, firstly they looked at all the occurrences of each genus and secondly they looked at the maximum distance between occurrences for each genus, an examination of geographical distribution based on an assessment of world geography at the end of the Mesozoic. The scientists discovered that most of the Ammonite genera at the very end of the Maastrichtian were restricted in their geographic distribution. This may have made the Ammonites more susceptible to an extinction event. This idea is reinforced when the geographical spread of those genera that may have briefly survived into the Palaeocene is examined. These genera have a significantly greater geographical spread when compared to non-surviving Ammonite genera. The research team suggest that those types of Ammonite that were more broadly distributed had a greater chance of survival, at least for a little while longer. This pattern is further emphasised when the distribution of the Nautiloid Eutrephoceras is considered. The scientists found that the distribution of Eutrephoceras was as broad as that of the most widely distributed Ammonites at the end of the Cretaceous. However, even the most geographically dispersed Ammonites became extinct in the Palaeocene, whereas Eutrephoceras survived. This new paper proposes that a broad geographical distribution may have initially protected some Ammonites against dying out, but it was no guarantee of their ultimate survival. The restricted distribution of Ammonites may have contributed to their extinction. Other studies have also helped shed light on the reasons for the demise of the Ammonoidea, Dr. Landman and his colleagues at the American Museum of Natural History have been at the forefront of many of these research projects. Many scientists now agree that Ammonite numbers and the range of species was in decline before the end of the Cretaceous and this Sub-Class of Cephalopods would have been devastated by the aftermath of the extraterrestrial impact event. Large amounts of acid rain falling into the sea would have significantly altered the pH balance of marine environments, this would have had a major impact on Ammonite numbers. In contrast, the deeper living Nautiloids may have been less affected by changes at the ocean’s surface and as they are less reliant on plankton as a staple source of food they could have ridden out the cataclysmic events. This may explain why there are two genera of Nautiloids around today but as far as anyone knows, not one species of Ammonite remains.